Designed and built with the utmost quality, our metal lathes are precision made with an extra rigid, one piece meehanite casting bed and heavily ribbed webbing. This combination of components provide maximum stability for heavy duty cutting with very little to no chatter in cuts which leads to longer tool life, better parts and more profit for end users. All slide ways are hardened and precision ground that results in outstanding durability/accuracy to make sure you keep making quality parts 30+ years without seeing wear. Our lathes are powered with a very durable high quality gears and precision ground to a certain spec tolerance and carburization treated for enhance durability. 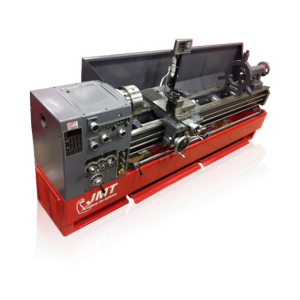 This precision allows for heavy cutting and is outfitted with well-known Japanese NSK Bearings and TECO motors, which makes JMT lathes the best value with the highest quality in their class. Bed sizes in 12”, 14” and 16”.